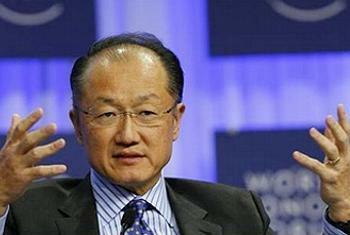 DAVOS, Switzerland, January 27, 2014 (ENS) – At the World Economic Forum in Davos, World Bank President Jim Yong Kim called for a price on carbon, requiring companies to disclose their climate risk exposure, and greater investment in green bonds in the fight against climate change. The forum, which wrapped up on Sunday, starts off a busy year for climate action as leaders in government, business, and finance aim for an international climate agreement in 2015. “Now is the time to act for future generations before it is too late,” the banker said. “In corporate boardrooms and the offices of CEOs, climate change is a real and present danger. It threatens to disrupt the water supplies and supply chains of companies as diverse as Coca-Cola and ExxonMobil. Rising sea levels and more intense storms put their infrastructure at risk, and the costs will only get worse,” said Kim. “CEOs know this. They also know there is opportunity in how they respond. But while there are stand-out leaders, many others are holding back until they have more certainty about what governments will do,” he said. At the World Economic Forum, Kim called on government leaders to break out of the small steps of business as usual and provide that structure. First, by putting a price on carbon and by having financial regulators require companies and financial institutions to assess their exposure to climate-related risks and disclose it. Kim also called for doubling the market for green bonds, which support climate adaptation and mitigation projects such as renewable energy, energy efficiency, and carbon reduction, to $20 billion this year and $50 billion by the time a new international climate agreement is reached in Paris in 2015. “The costs of failing to act on climate change are staggering in the lives affected and investments lost,” he said. According to the United Nations’ top climate official, UNFCCC Executive Secretary Christiana Figueres, the discussions on climate change at this year’s World Economic Forum provided the clearest indication yet that 2014 will be the year when the world can and must come together to meet the growing challenge of climate change. “The mood, ambition and announcements at the World Economic Forum in Davos has left me feeling more energized and confident than ever that 2014 will be the year when the world can and must come together to meet the growing challenge of climate change and seize the opportunities manifest in a transition to a low carbon economy,” Figueres wrote today. “There is almost no better place than the WEF to put your finger on the pulse of what global business and political leaders are thinking and get a sense of the trends that shape the lives of billions of people on this planet. Undeniably, climate change is now right back up there among the top concerns of business and political leaders,” she wrote. Speaking at a high-level panel on Climate Day at the World Economic Forum in Davos, United Nations Secretary-General Ban Ki-moon called on banks and other financial companies to increase financing for development of sustainable energy sources and businesses with low carbon footprints. “Recently I visited the Philippines. I saw yet again how climate change is – quite literally – an existential threat. I have seen the same threat in the Sahel, Kiribati and many other places. We have to limit global temperature rise or we will never achieve sustainable development and eradicate extreme poverty,” said Ban. That is why Ban will host a Climate Summit at UN Headquarters in New York in September for global leaders from government, business, finance, and civil society. “The summit has two goals. To catalyze ambitious action on the ground to reduce emissions and strengthen climate resilience. 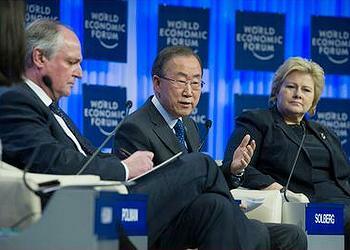 And to mobilize political will for a meaningful global legal climate agreement by 2015,” he told the Davos audience. The summit is considered crucial for catalyzing action and building political momentum for a successful global climate agreement in 2015. The next two years are “critical,” Ban said. 2015 is also the deadline for the Millennium Development Goals and defining a post-2015 development agenda. According to World Bank Group estimates, in the poorest countries, climate change will increase the cost of development by 25 to 30 percent. The impacts could roll back decades of development gains and push millions of people back into poverty. Globally, weather-related losses and damage have risen from an average of about $50 billion a year in the 1980s to close to $200 billion a year over the last decade, making climate-resilient and disaster-resilient development critical. The World Bank Group is focusing on several key areas that Kim says can help get prices right, get finance flowing, and make progress where it matters most. Building low-carbon, climate resilient cities, particularly through assistance with low-carbon planning, energy-efficiency assessments, and securing finance, targets the fast-growing metropolitan areas that are connected to 70 percent of global emissions. Moving forward on climate-smart agriculture improves yields to feed a growing global population, reduces emissions, and adds carbon storage. Accelerating energy efficiency and investment in renewable energy helps shifts the world away from high-carbon fossil fuels. The World Bank Group is also supporting work on ending fossil fuel subsidies and developing carbon pricing to get prices right for emissions. By reducing short-lived climate pollutants, such as soot from fires and diesel vehicles and methane from landfills and extractive industries, countries can reap a double reward of reducing the impact on snow and glaciers and lowering the costs to human health and crops. Throughout this year and next, the World Bank will be working closely with governments to provide the data, evidence, and analysis necessary for each to set robust national emissions reduction targets and for developed countries to also provide the technology, finance, and capacity-building support that developing countries need to start on a clean-growth trajectory.